my iguana is 16 yeas old and he wont eat. Im so worried. I hope he's not dying. Should I take him to the vet? I called a prehistoric pet store and they said sometimes they dont eat for a long time. But, I dont think its good. Can anyone help me please? Whenever you have a health problem, call the vet. When you are sick do you call WalMart? People working at a pet store may not have any idea what they are talking about. But that won't keep them from talking! But I agree! Call the vet! Not just any vet though! Okay, I'll take everyone's advice. I'm taking Hammer (my ig) to the vet today. Let's all hope he's okay. Be sure to let us know what the clinic says! reesee!! I'm thinking positive thoughts!! Hope things are ok...Maybe he's got a problem in the tummy. Keep us posted on his outcome. Well, I took Hammer to the Vet and She said he needs more calcium. His bones are brittle and he has a fracture in his leg. But she doesnt seem to know why he's not eating. She thinks its because its been cold. She told me to get him some calcium w D drops. I'm still confused and sad. How am I suppose to feed him. She said baby food. She kinda rushed me cause she was slammed busy. I dont know what kind of baby food. Ugggg! 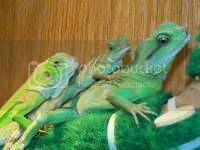 Do you know if that vet have a lot of knowledge in reptiles? What did the vet do about the fracture in the leg? 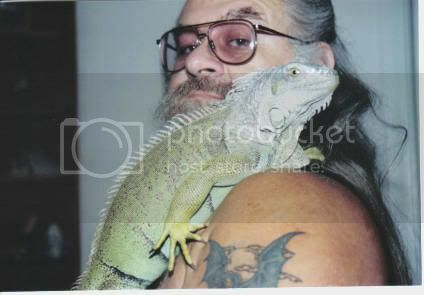 Have you had your Iguana for the whole 16 years? Maybe it could be some sort of parasite or of old age? When was the last time your Iguana pooped? How does it look like? Does it look normal? How is your Iguana acting? Have you notice a change in behavior? How are his eyes? Clear or crusty? Also give us the specs on his enclosure. DO NOT get calcium with vitamin D in it! Straight calcium - nothing more. So let's see what kind of things need to be tweaked as far as his care goes. He has MBD if your vet said brittle bones and calcium deficiency. * Cage - How big and what kind (aquarium, screen, etc? * Substrate - What do you use on the bottom of the cage(s)? * UVB source - What do you use for UVB (brand and strength)? * Heat source - What do you use for heat? * Temperatures - What are the temps in the three different areas (basking, ambient, cool end/night)? * Thermometer - What do you use to monitor the temps? * Diet - What foods do you feed (list specific items)? When the vet said she thinks its because its been cold. is she talking about the weather or the cage? Did she ask all the questions that Prism asked about? If so did she know why your Ig would have MBD and what to correct for long term or just say give the drops? Did she suggest calcium shots or appetite stimulants? the D-3 it needs., much better and safer than a supplement. Also helps stimulate the appetite. Your UV bulbs are going to be the second best but probably most important, How many of us have the time and weather to keep our Igs out in the sun all day. the vet wanted to put a splint on it. but, she said it could heal without one. should i have had her do that? Yes I have had him for the whole 16 years. he hasnt pooped in a while. maybe just a little white stuff. His eyes are clear. He's acting calm. But when I pick him up he tries to climb all over me. He looks normal but skinny from not eating.